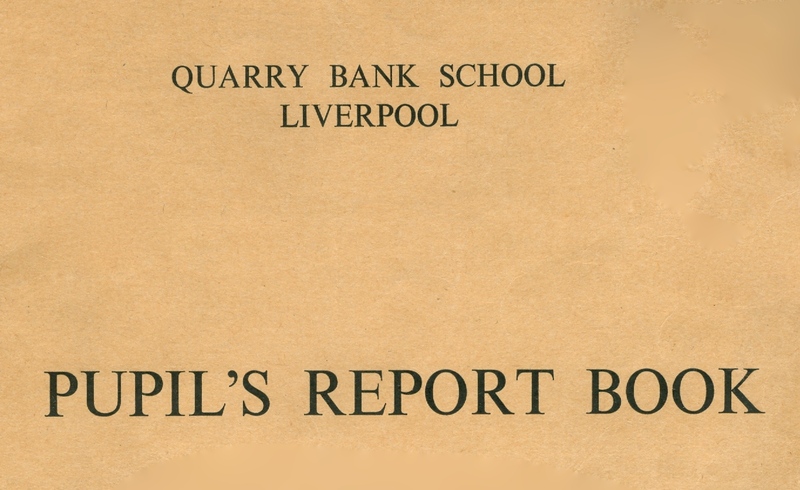 John attended Quarry Bank – which was, at the time, considered one of the top two High Schools in the city of Liverpool. The other one was the Liverpool Institute where Paul and George both attended – there was always a rivalry between the two schools jockeying for first place. If you visit the Rock and Roll Hall of Fame in Cleveland, you can see the following page from John’s school report book (below) which has comments from each teacher, with their initials, and semester rating for each topic. 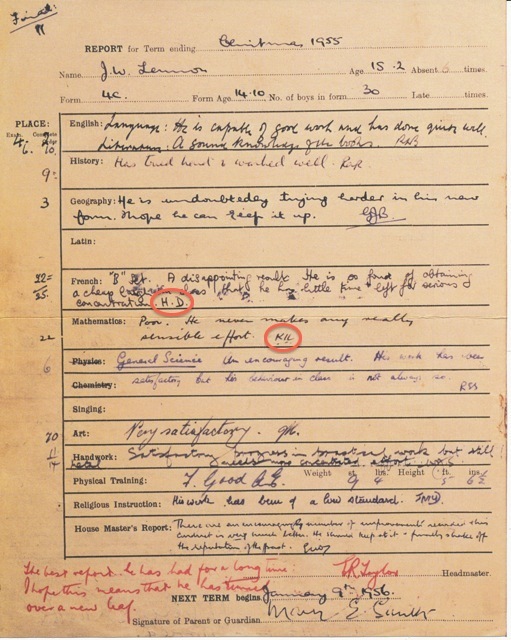 This particular page shows John’s report at age 15 at the end of the Christmas term. The year was 1955. Twelve years later, I was 15 and at the end of the Christmas term with a report card that looks remarkably similar (below). Quarry Bank was a pretty fancy school for the times – you could only get into it based upon merit, my parents had no money and I entered based upon a “life make or break” examination system called the 11 plus that everyone had to take in that era. The exam consisted of three written examinations – arithmetic, comprehension ( I think) and an IQ style test. The last year of my Junior School was spent practicing over and over again for this exam – guided and driven by a ‘Mr. Wallard’ – considered a terror by many kids, but he was one of those pivotal people in my life that got me to Quarry Bank. I have tried to trace this man – who he was, more about him – to thank him, but in vain. The School was established in 1921, and the main building was a grand sandstone structure with multiple additions and large grounds for sports, bee-keeping (a little more on that later) and, by the time I attended, our own gym, wood and metal work shops, an indoor swimming pool, science laboratories and one of the first high tech language labs. Class year photographs were taken at the end of the first year and this is mine below, that shows you the grandeur of the place. Close to me on the back row, fourth from the right is Clive Barker of ‘Hellraiser Fame’ (and much more) – another famous, but not so famous alumni. 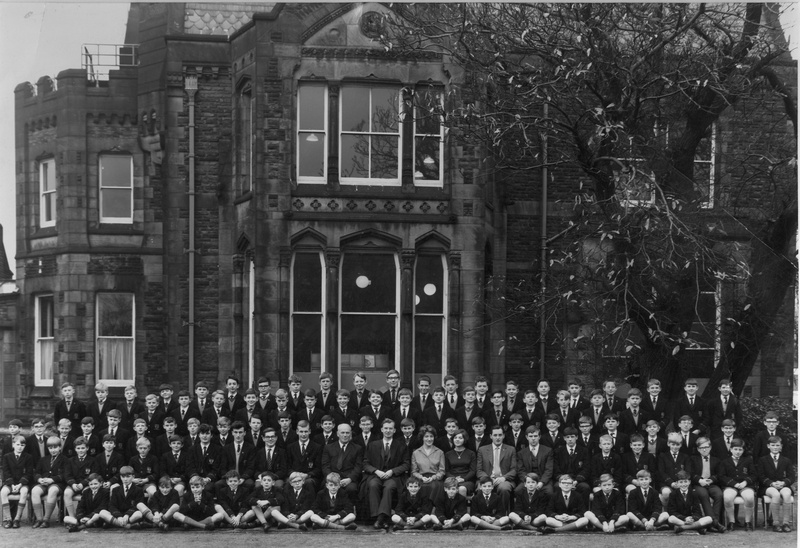 Notice the front rows of students all wearing short pants – in fact everyone will be, as this was the rule for the first year in the school – we were called ‘newts’ and you can imagine the persecution from the rest of the school of teenage adolescent boys who all wore long pants! Below you will see a class picture at Quarry with John circled. Notice the same main building behind the group, and the identical uniforms. You can see the front row boys with short trousers again, but I believe that this picture is part of a full school photograph so I am unsure of John’s age here. John does stand out with the ‘Skiffle group’ hair style in this picture. 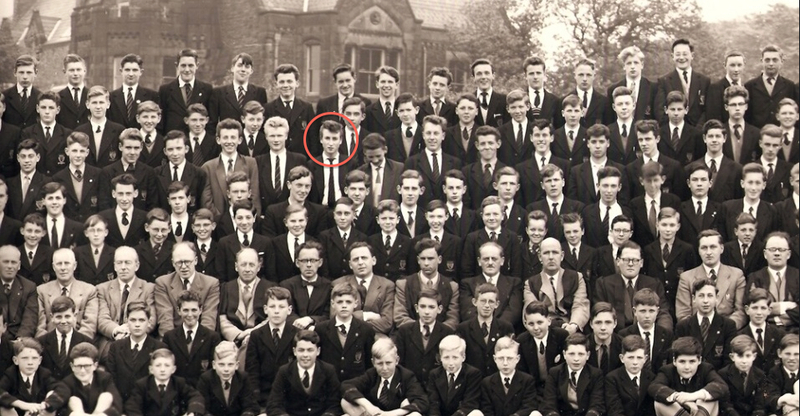 The equivalent in my class picture at that time would have been a Beatle cut (over the ears) – but no one would even dare. Back to the report books. You will notice on John’s report card that I have circled two teachers that taught both John and I. The first initial is H.D. – the French teacher. This was Harry Deutsch (spelling of surname may not be correct). He was a charming individual, very kind with the boys, who had difficulty with controlling a class room full of adolescent males sometimes. Well, most of the teachers struggled with that if I recall. The second one is ‘K.I.L.’ This was the renowned Physics master – Mr. Leishman. I noticed he was teaching Math in John’s era. With initials K.I.L., it was inevitable in an all boy’s school that his nickname was “Killer”. And he was pretty tough – and physics was not the easiest of subjects. Killer’s reputation was enhanced by his lunch time activity of minding the beehives that were located in a corner of the grounds – he would smoke a pipe and ‘smoke’ the bees, often without head protection gear. There was a rumor that his complexion was the result of a massive bee stinging attack, although I strongly suspect it was simply acne. The School was very focused on testing and written exams. Killer use to give us a short test every week or two and then re-rank the class, and let you know that on average the bottom 10 students out of the class of 30 would not pass the ‘Ordinary Level’ exams. You will see on John’s report card his ranking for every subject and then an overall ranking. I notice that his class size is 30 – the same as mine, so that did not change in between the 12 years between us. I see that John was in Class 4C. At Quarry the first year intake was 90 boys, divided into three classes of 30. Everyone was taught at the same pace for that first year, after which the top 30 were placed in a fast stream class (becoming Class 2A, then 3A, etc). This fast stream class took their ‘O’ levels a year ahead of the remaining other two classes at age 15 instead of 16. 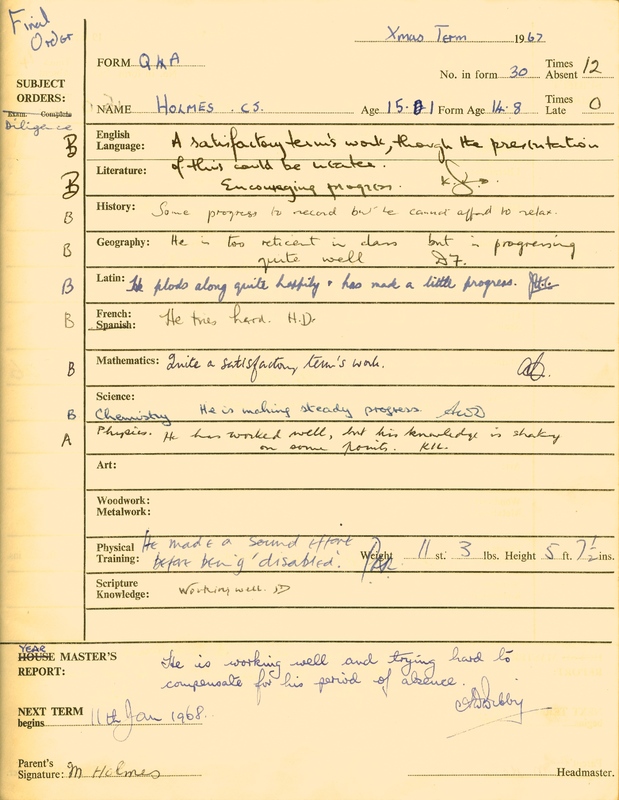 Class 4C meant that John was not in the fast stream and looking at Harry Deutsch and Killer’s comments – John was just not interested in academic pursuit. 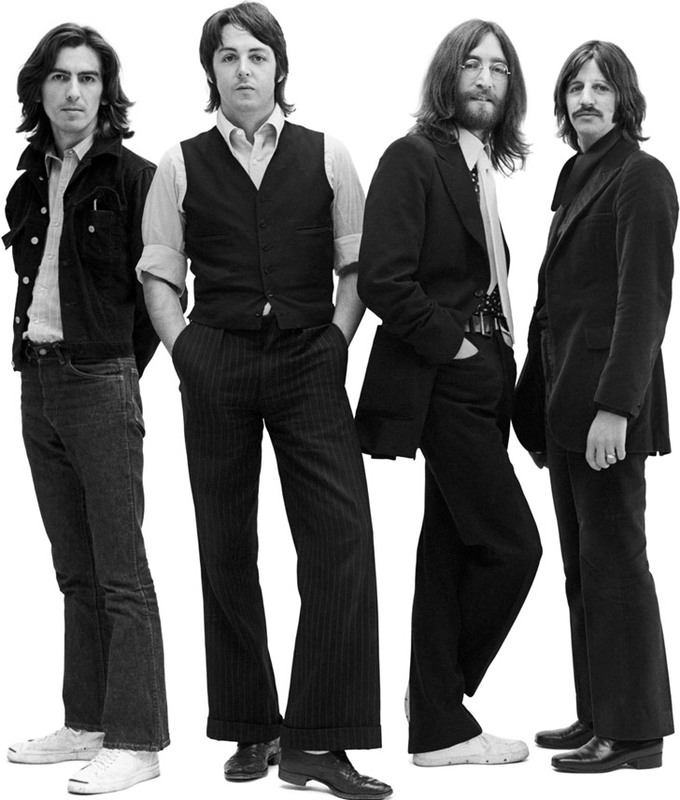 This entry was posted in A Liverpudlian's Beatletown and tagged Beatles, clive barker, hellraiser, John Lennon, Liverpool, Quarry Bank School by hankinsonholmes. Bookmark the permalink. Thanks for those comments Norman. I worked in the medical field (Ph.D. in pharmaceutical microbiology, and 35 years in industry developing dialysis products in the US), but I confess I have had only peripheral exposure to lipids and cardiac disease (their role in cardiovascular morbidity & mortality in renal disease). However, I have just seen your publication list and recognize what an truly important contribution you have made to the field and illustrious career you have had. Many congratulations. Cliff. What year is the large Quarry Bank group photo? I think it was 1964 or 65. Thanks,just that alot of the school has been knocked down hasn’t it? Is that building still there?